The Virtuous Life of a Christ-Centered Wife  Lesson: Two "A Kind Wife"
Today we are discussing the virtue of kindness. When I consider this scripture…be ye kind, be tenderhearted, and forgive one another, I am reminded of the beautiful and intelligent woman I met last summer. As I prepared to teach a local women’s bible study, the Lord directed me to study 1 Samuel 25. Her story of “kindness” to an intolerable husband is lovely…. At this time, Samuel has died and David along with his 600 men are residing in the Wilderness of Paran. There, they are hungry, lonely, and exhausted. Nabal, a very wealthy man is shearing his sheep in Carmel, in southern Judah. So David, according to custom, sent ten young men to greet him. These men came before Nabal, under the authority of the future King of Israel. They were requesting food and provisions, for protection which David had previously given to Nabal’s flock. Nabal, a surly and mean fellow, insulted them and rejected their request. Upon hearing this, David was enraged. He and 400 men made their way to Nabal’s house for revenge. The punishment doesn’t seem to fit the crime here!! Murdering a man’s entire household is not just punishment for disrespecting a future king, but David is furious. He wants justice at any cost. Here we are getting a picture of the man Abigail is married to. He is harsh, selfish, abusive, a cheater, mean, and that’s just a few words to describe him. Nabal is obsessed with his own well being. He is not concerned about the welfare of the future King or the attack on his household. He is so prideful, that he insults the men that came to bless him. Nabal means fool. Now, a servant informed Abigail of the meeting between Nabal and the ten young men, as well as David’s upcoming attack. 1 Samuel 25:17a “Now think it over and see what you can do,” the servant asks of Abigail. This servant saw that Abigail was kind, compassionate, caring and approachable. Her behavior was not that of her husband’s, and the entire household knew it!! Ladies, what is your attitude like? When there is a crisis in your home, are you approachable? Do calmer and kinder heads prevail? As wives, daily time with the Lord is necessary in order to maintain a godly perspective on life’s challenges; especially, if we are living with a spouse who battles with negativity. Now the servant who approached Abigail saw that she and her God could handle a crisis. Once Abigail considered the matter, she lost no time gathering food and provisions for the future king and his men. Abigail did not complain, nag, or yell at her husband for bringing this upon them. Because Nabal was so engrossed in his possessions, she knew he was not of clear mind. Abigail continued to show kindness to her husband, by meeting with David in hopes of sparing his life. This was done discreetly and unannounced to Nabal. As Nabal’s wife meets with David and his men in the ravine, she quickly gets off her donkey and bows down before him. Abigail falls at his feet, taking 100% responsibility for this matter. Abigail then speaks with kindness and compassion, redirecting David’s mindset from anger to remembrance. She reminds David that the Lord takes vengeance on His enemies. She reminds David of the lasting dynasty that will come through him. She reminds David that the Lord fulfills His promises. She reminds David how good it feels to rest with a clear conscience by not shedding innocent blood. David considered all she had said and he praised her for her good judgment. He granted her request, sending her home in peace. Once Abigail arrived home, she finds Nabal holding a banquet; he is extremely drunk. Again, she does not sin, but chooses to extend kindness to him by remaining calm and controlled. Abigail goes on about the evening, waiting for daybreak. At daybreak, Abigail informs Nabal of her intervention with David and the 400 men, in the ravine. The bible tells us,” his heart failed him and he became like stone.” (stroke or heart attack, possibly.) Ten days past and “The Lord struck Nabel and he died.” Sometime after his death, Abigail became David’s wife. She continued to serve with the same kind, loving and humble attitude. 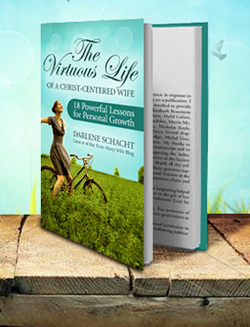 Darlene Schacht shares with us the 7 habits of a kind wife. I encourage you to take a closer look at the life of Abigail…what an example for us to follow!! Continue to exercise…… the virtue of kindness today.